It's been a while since I actually COMPLETED one of these.. LOL Either way, I enjoyed doing another blog about a Sasuke competitor! Each time I learned something new about someone else and adore sharing it with others so they are as enthused as I am :) Previous interview blogs on competitors from past Sasuke competitions (Michael Milner (Sasuke 20) and Luci Romberg (Sasuke 21), Brett Sims (Sasuke 19 and 20) and David Campbell (from Sasuke 22). This time it's Timothy Coombs whom most people remember as the ebay Auction winner from Sasuke 27! In my research about him I was stunned to find out how accomplished he is! 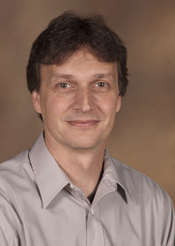 Without further ado here is the interview/questionnaire with Dr. Tim! RR: Having no idea who you are personally - Could you give me a brief biography. Things that someone who doesn’t know who you were on (Sasuke), or saw you on TV, you would want them to know more about you. o Where are you from? o How old are you? o What do you do for a living? o Basic philosophy on life? o Were you an athlete in school? o Do you have any siblings? TC: I have been married for nearly 25 years, we have no children and I am 51 years-old. 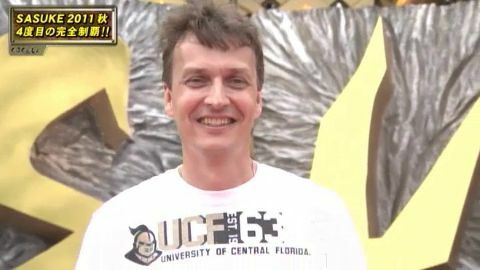 We live in Orlando, Florida where I am a Full Professor in the Nicholson School of Communication at the University of Central Florida. Orlando is a great place to live because of the weather and many things to do. We have annual passes to Disney World and visit for special events. I also compete in the 5K races Disney offers. There are about five of those per year and are amazing events. My favorite it is the Everest Challenge, a combination 5K-obstacle course-scavenger hunt. I believe in trying to maximize human potential. In high school I ran track. I was a hurdler but also ran the 400 meters. I was the MVP of the track team my junior and senior years. I have two older sisters. RR: For those of us who followed the process when the eBay option became available this will be self explanatory but for those who didn’t know this even happened (like international viewers) - could you explain the process on how you got on the show? 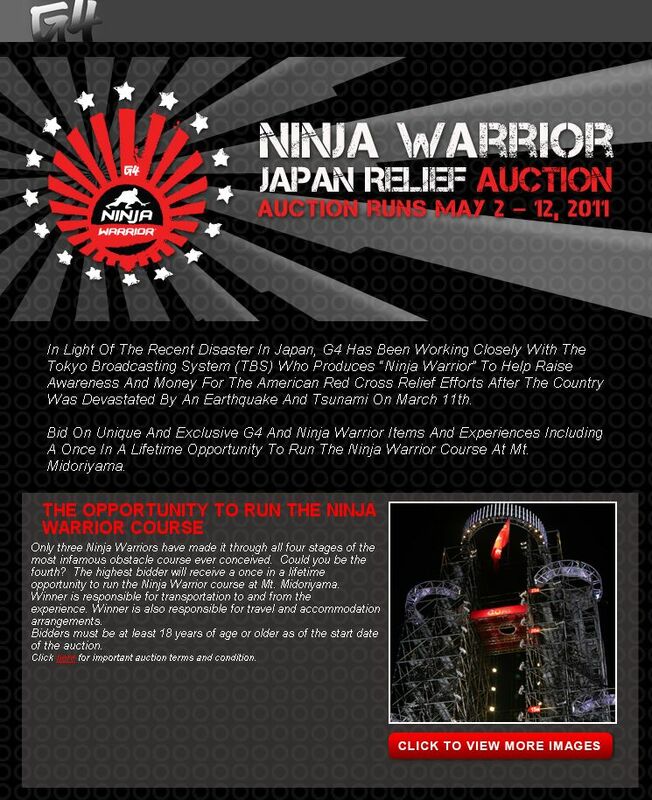 o How did you first become aware of Sasuke/Ninja Warrior? 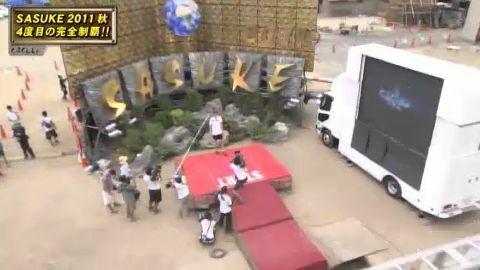 TC: I learned about Sasuke/Ninja Warrior from watching G4. 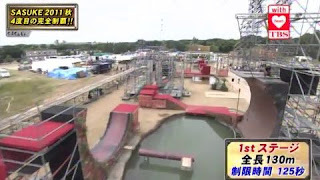 One day I was scrolling through the on screen guide and saw the show “Ninja Warrior” and the description mentioned obstacle course so I watched and was hooked. I am always excited when they announce a new season to show and love the marathons they run. I always thought it would be great to see the show tape but never thought I would get a chance to be on the course. The competitors are amazing. I heard about the auction during “Attack of the Show” I knew I had to bid on the prize because any other way of getting there is slim. The American Ninja Warrior competitors are very tough to beat. I immediately updated all by eBay information, we had moved the year before to Florida, and jumped in. I really did not even believe I had won it until the official information started coming in. o Before the eBay auction, did you create an entry video for previous ANW’s and/or ANC competitions? If so, what was in the video? Do you still have the video? TC: I had never entered the American Ninja Warrior but had thought about it. Just was not enough time with work. So I have no videos. o How much time did you have to prepare for Sasuke 27? TC: I did not have much time to prepare. They notified me around June 16th about when the competition would probably be. That date was July 18th. So I had less than a month to prepare. But two weeks of that time I had to be in Europe on business. I was giving a three different research representations in three different countries during the two weeks (Spain, Slovenia, and the UK). I had been running as part of 5K training. I added in some plyometrics and yoga as well. I even built some steps to practice the start. o Many of us felt the auction should have had some concessions towards arriving at Sasuke and others not.. How difficult was it to afford to participate in Sasuke 27? TC: Cost was not too bad. 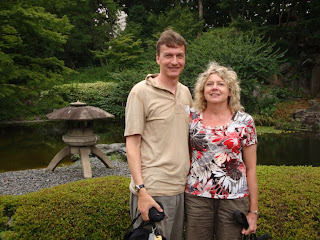 We used frequent flyer miles for the plane so the main expense was the hotel in Japan. Tokyo is expensive but I go to Europe frequently for business and that is expensive too. o Did knowing how expensive it was going to be just to GET to Sasuke 27 did that affect how much money you donated to the auction to benefit the Japanese Red Cross? TC: I knew I could cover the travel so those costs did not affect the amount I was willing to bid. 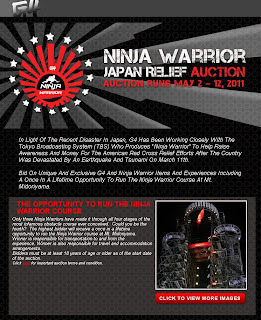 Knowing the money would go to the Japanese Red Cross was the reason I was willing to bid so high. It is an important cause so the money was well spent. o How long was your total trip to Japan? TC: We left on July 14th and returned on 21st. 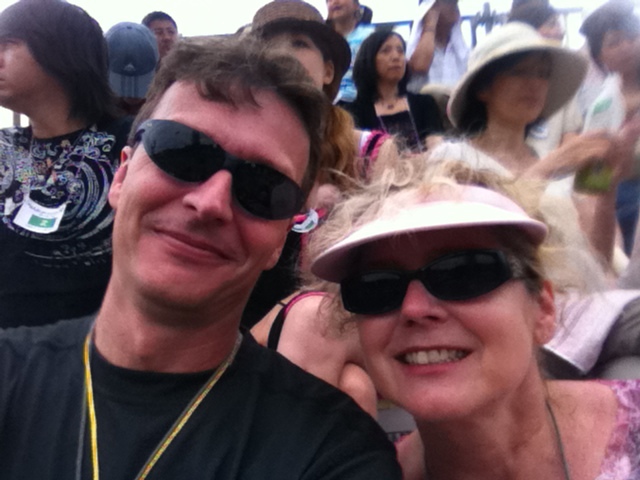 Chicago to Tokyo was a long flight (over 12 hours) but I had done it once before. o Did you manage to stay with other competitors or were you basically on your own? TC: We stayed at the same hotel as the production staff of G4, the competitors were at another hotel. o Did G4/TBS/M9 help in any way in directing you to the competition or suggest places to stay? TC: G4 was very helpful. They suggested staying at one of the two hotels they were at so that we could ride over in the morning on their bus. They and the people from TBS took great care of us that day (my spouse Sherry went with me). We rode over and back on their bus, they had water and energy drinks with snacks, and bought us lunch and dinner. The G4 people, especially Kristen and Bryan, were wonderful to us. o Did you have time to sight-see? 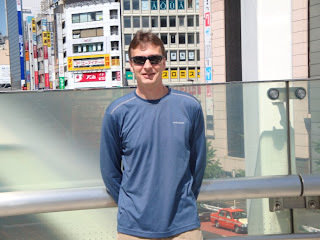 Any photos or stories of interesting places you visited while in Japan? TC: We did have a few days to sight see. One day we took a day-long bus tour to see a lot of the sights. The other days we wondered around, mostly lost, through various shopping areas. 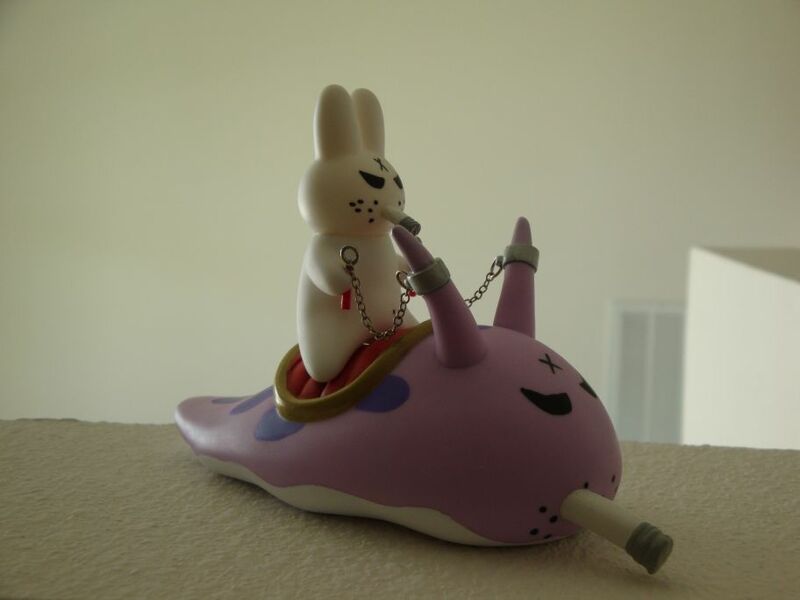 I am sending along some pictures including my favorite figure I bought on the trip. It is a very long day to tape Sasuke. o What time did you get there (on competition day)? o Do you still have your saddlecloth? What number was it? TC: I was number 31. Unfortunately I did not have a physical number to wear. o Do you have any favorite competitors you like watching? TC: My all time favorite is Nagano. I also like Shingo Yamamoto since he has been at every competition. I also was able to meet all of the American Ninja Warriors. A great group of competitors, they were very nice and extremely talented athletes. • Did you get to meet any competitors? 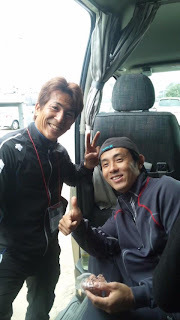 TC: I was able to meet and talk with Nagano. He autographed a shirt for me. I cannot tell you how thrilling that was to get to meet him. I also met Octopus Man. He looks even stronger in person. You would not guess he was over 60. • How was your experience being part of Sasuke 27. Competitor and Spectator. TC: It was a fantastic experience being on the course and getting to watch the event. I liked being a spectator because I was not nervous doing that and seeing all the great athletes in person was so impressive. • Have you kept in touch with any competitors as a result of your participation in Sasuke? TC: No have not been able to stay in touch with any competitors. • Describe the wait for your turn.. I’m told it can be nerve wracking. TC: The waiting is tough. You are out in the heat and dust waiting next to the starting area in a line. There is not a lot of room to move around once you get in that part of the line. They run people in groups of ten. I was in with a group that contained women and people over 40 so they make minor adjustment to the course. That added to the waiting. The nerves build as you see those in front you hit the water. I always wondered why people started slowly and now I know why. There is a camera person standing in front of you so you cannot really go until the camera person moves. • Before your run, how far did you expect to be able to go on the course? TC: I thought I could as far as the Rolling Escargot. There is no way I could practice for that and had seen how many competitors it had taken out in the past. It was not a happy surprise to see that they had moved it up on the course this year. • Were you surprised by the Rolling Escargot? TC: I was surprised it was the second obstacle and by how fast it spins. • How long did you stay? In the past, first stage competitors were asked to leave after their run. Were you asked to leave? About how much of the tournament did you get to watch? Any stories about watching Sasuke you want to share? Things that surprised you about watching it live vs. television? TC: We stayed through Stage 3. In addition to a competitors pass, they gave use “all access passes.” We could go anywhere around the grounds. 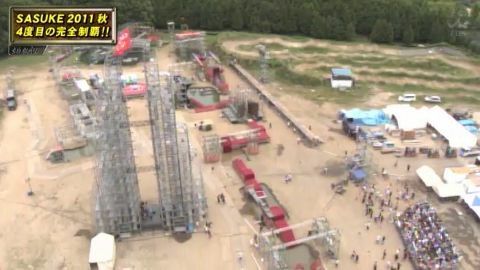 That gave us a chance to look at the later stages up close and to watch the other two stages. Stage 3 ended around 4:30am so it was getting late. Stage 2 is lit beautifully. It looks even more impressive in person. Stage 3 takes forever to get through. After each run they have the competitor watch his run on a large video screen and comment on the run. Then they begin the complicated process of re-setting the course. I think they do it this way to show respect for the competitors. But when it is that late you want things to move along. Sherry fell asleep standing up at one point during the wait between competitors. There were 10 people on Stage 3 so it must have lasted around 2 hours. Also the water on Stage 3 looked the most disgusting of all the water. Very slimy looking. They have people help you if you have trouble climbing up the muddy banks. And it is just mud. There are a few portable showers were competitors can wash off the mud. I used run after my swim. The fans are an important part of Stage 1. After that, there are still some people cheering but far less crowd for 2 &3. Also no stands for sitting except in Stage 1. • Do you have a favorite obstacle? (One you tried or one that you wished you could try). 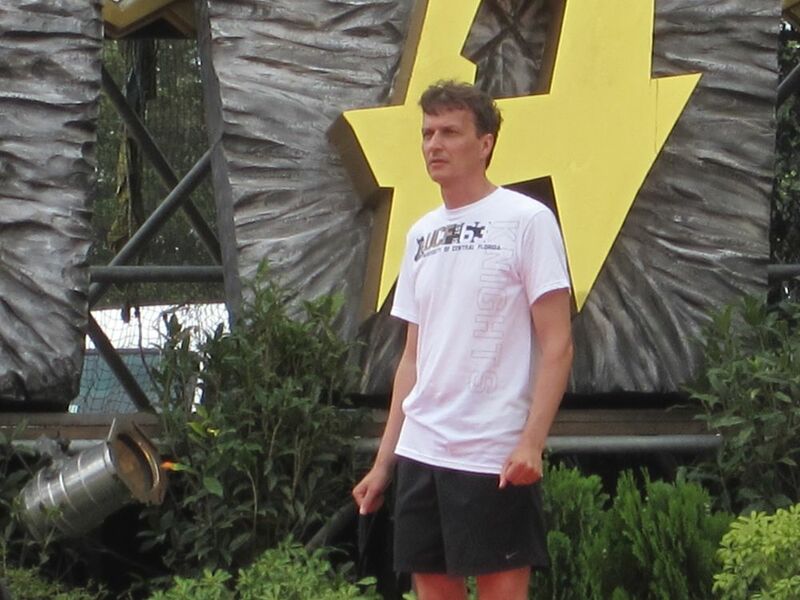 TC: I wish I could have tried the warped wall. I have always felt that would be a good for me and would like to see it that is true. • Did you watch Sasuke alone or with friends/family? If so, did you watch live when it aired? Or waited until a copy was made available or still haven’t watched it? TC: I have a DVD copy that I will share with my family during my next trip back to Ohio. • Knowing what you know now about the experience.. would you do it all over again? TC: I would definitely do it again, even with an early Rolling Escargot. It was a fantastic experience that I treasure. It was a great honor to be allowed on that Sasuke course. • Will you try to enter another tournament? TC: Yes, I have changed my training to more upper body and hope to try out for the nest American Ninja Warrior. 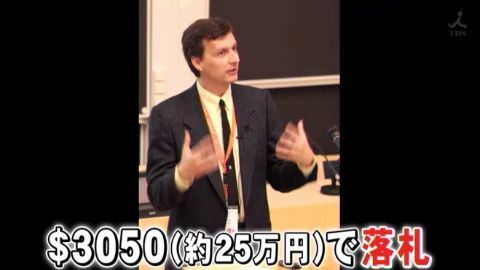 It is a long shot but I would like the chance to earn my way back to Japan. o How did you find out about Sasuke? TC: I found out about Sasuke from watching G4. I like their information on video games. o Why did you end up buying the auction spot? 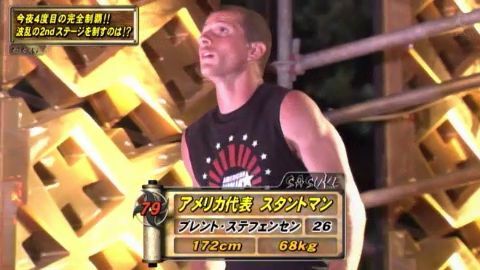 TC: I love watching Ninja Warrior and could not pass up a chance to be on the course where I have seen all those great competitors in previous tournaments. o Did you meet anyone while you were there? This includes the Japanese All-stars, the Americans, or even the G4 crew. 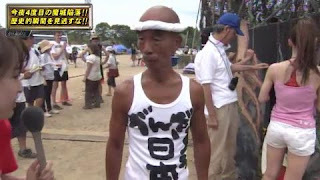 TC: Yes, I met Nagano and Octopus Man among the Japanese competitors. I meat all 10 of the American Ninja Warriors plus Brian Orosco who was an alternate. Turns out Brent Steffensen and I share the same birthday, July 18th the day of the competition. (RR: Happy belated you two!) 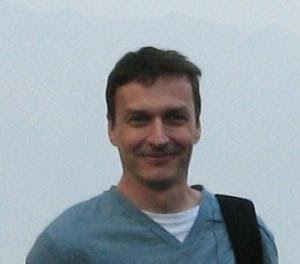 David Campbell is an amazing source of information about the course. I met the production staff I worked with, Kristen and Bryan. I also met Alison and the Haislip. o Did you get to speak to any of the other competitors? 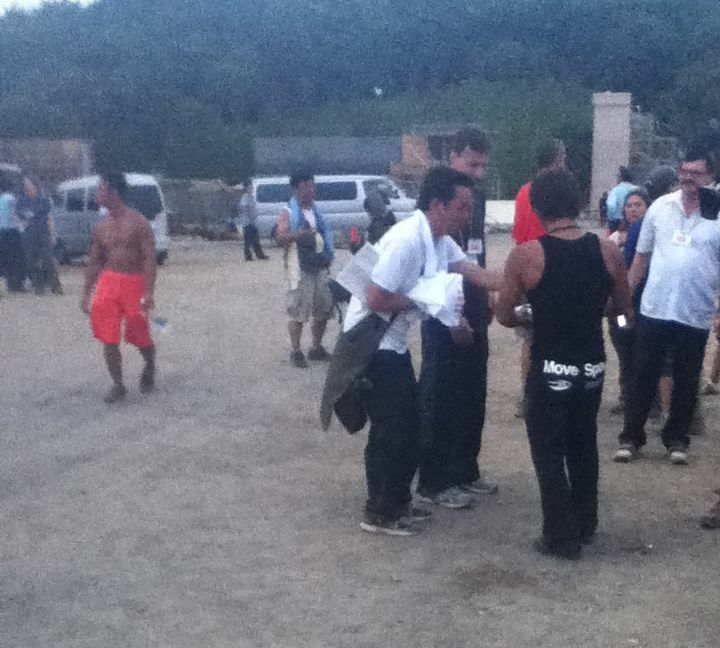 TC: Yes, I was able to talk with the American Ninja Warriors. They gave me advice about the course. The advice was great, my execution was not. I was also able to meet and talk with Makoto Nagano. o Did they make you leave after your 1st stage run? TC: No, I was able to stay and watch the rest of the competition. Stage 3 ended around 4:30am. I was there to cheer on all those who advanced. Amazing to see it all live. o What was running through your mind before starting? 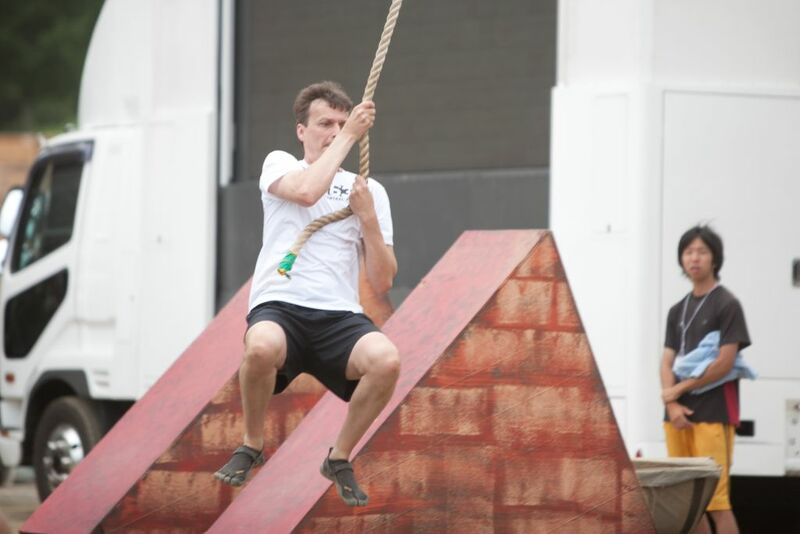 TC: Don’t fall on the steps and keep your feet up when swinging on the rope. Tried to focus on one obstacle at a time. o Hi Tim, I was just wondering if you could give us some insight as to what your itinerary was during your trip and if you could share with us some of the things that stood out to you at Sasuke 27. Also, for what it’s worth, I think you could have passed the first stage. TC: The day before I met with production people from G4 to go over the basics for the next day. The day of it was up early an on the bus by 6am. We arrived at the TBS back-lot about 7am. Waited on the bus until they were done filming reaction shows for the ANW competitors. They were so impressive in those K-Swiss outfits. They you walked down hill to the registration area. I had an interpreter for that part. I answered a series of questions and signed a few more forms—liability stuff. TC: Then it was back up the hill for hill for and the shooting of the opening where everyone raises their hands. After that I did some shooting with the G4 people then it was warm up time. Prior to each stage they have testers show how each obstacle is done and prove that each can be done. I was able to see some early competitors since I was number 31. The second guy pulled the Rolling Escargot off the track and it landed in the water but missed him. My group went about noon. When I was at the start, the announcer was saying who I was and other stuff but I had no idea what he was really saying. No subtitles when you are on the course. After my run, I used a portable shower to wash off the mud and changed clothes. Had lunch as I watched the rest of Stage 1. I was very exciting. Too bad about Drew’s injury though. TC: There was a break of around an hour then it was Stage 2. By then it was dark and the lights looked great on the course. There was another break of about an hour then Stage 3. By the time it ended it was 4:30 am. There was some lightning so they were unsure when the final stage would go. It was close to 6am when that happened. o How intimidating was the course in person, or would you have a different word to describe how you felt upon seeing the course without the restriction of the television screen? TC: Intimidating is a good word. It looks bigger in person and more difficult. In person you see how long the course is and get a better understanding of why people get fatigued by the stages. With no restrictions you could focus on the parts of the course you really wanted to see and at how carefully they reset the course to make sure everyone runs the same course. This includes drying off anything a previous competitors gets wet. o Are you going to tryout at the next ANW for another chance at Sasuke or was this just a 1 time adventure? TC: I am planning to tryout for ANW. This has inspired me to work on upper body and to study parkour. I plan to build some obstacles this winter for extra practice. o For how long have you been a fan of the show? TC: Since as long as it’s been on G4. I watch all the reruns and marathons as well as the new seasons. I find what many of the competitors can do to be amazing. o What was the most surprising thing about your Sasuke experience? The obstacles, the production team, the competitors, or something else? TC: How long and punishing the day is by itself. This is one long day, and in this case, very hot day. It was well over 90 degrees. It was 4:30 am by the time Stage 3 completed. That is a long day for the competitors so they are fighting more than just the current stage. They have the fatigue and humidity as well so give them even more respect. It is a brutal competition without the time and elements so my respect for the competitors can do grew even more and it high to begin with. • Wipeout Star, 13, Sunderland! o What was the hardest obstacle you tried? TC: Rolling Escargot. It spins fast and it is hard to lock into place. I did not get close enough to the board and needed press out more firmly. TC: Yes, by a quarter of a turn I knew I would be in the water. o Do you think the auction was right or do you think a world wide lottery would of been fairer? TC: Auction was a great way to raise money in a short period of time. But I’m bias because it did allow me to go. o P.s congratulations on getting as far as you did. My biggest fear would be going weak from being nervous and not making the first obstacle . TC: My biggest fear too was not clearing the first obstacle. Saw a number who did not, including one rising star from Taiwan who let his feet drag. Little mistakes are costly there. o Did your fall from the Rolling Escargot come as a total surprise to you, or was this obstacle something that you had been worried about? TC: That was the obstacle I feared. I mentioned that to the production staff at G4 before we arrived at the course. o Had you made it past the Rolling Escargot, how do you believe you would have fared on the remainder of Stage 1, and what do you believe would have been the most formidable obstacles there? TC: After that I think I matched up well. Next hardest would have been the jumping spider. But most in Stage 1 are jumping and balance and that works for me. The rolling balls looked cool. o When did the eBay auction occur? How much training and prep time did this leave you prior to the competition? TC: The auction was in April. I knew about a month in advance when the competition would occur so I had less than two months to prepare. But I lost two weeks training right before the event because I was on a business trip in Europe. Did some running but that is not enough. o Did you have any time to socialize with the other Sasuke competitors? If so, do you have any interesting recollections or stories you would like to share? TC: There were two meetings that really stand out. First, I had a chance to talk with Makoto Nagano, through a translator. I told him it was an honor to meet someone I had watched compete to well over the years. He thanked me for contributing to the Japanese Red Cross Relief. He then autographed a shirt for me. I was really stunned by it all. He is the competitor I idolize and to meet him was a huge bonus. TC: The second was a chance to talk with David Campbell before I went on the course. He knows so much about all the obstacles. He gave me fantastic advice, I wish my execution had been better. Such a nice person and incredible competitor. o Could you talk a bit about pre-Sasuke your training routine? Do you feel it was sufficient for Sasuke? TC: I wish I had had more time to focus on strength and agility. My travel right before hand made that very difficult. I now have a better idea of how I need to train. But that is always the case. o What are your future plans for Sasuke? Will we be seeing you on a future ANW competition? If you do plan to compete again, will you be making any changes to your training routine? Again thanks for taking the time to entertain these questions, and best of luck to you in future competitions. TC: I plan to tryout for ANW. I am doing a lot more upper body work. Started with a power tower to build strength and will shift to some obstacles I plan to build over the winter. Want to work on the bars and the salmon ladder. That is plan for now. Thanks so much to Dr. Coombs for taking the time of his ridiculously busy schedule for this blog! It was a lot of fun and very enlightening. All of you know I adore knowing the back stories of competitors of Sasuke and seeing why they get on this awesome show :) I know I'm happy to learn more about him other than "the eBay winner". He's a really cool guy! Another great interview RR! Dr. Tim sounds like a really great guy and it was wonderful to find out more about his experience. A good person won the auction! Thank you for answering my question . I am glad a genuine fan won the auction . Good luck with all future attempts. Great interview RR and Dr. Coombs! My favorite part about these are the stories that you don't see on TV--how the course looks in person, other things you did in Japan, meeting the other competitors, nerves before the start, etc. Thanks for sharing!